Founded in 1971, American Litho Color began as a color-separation trade shop. At that time, separations were made using conventional, photographic, reproductive processes. Vacuum frames and process cameras were state of the art. American Litho Color built its business and reputation on providing only the highest quality color separations. Quality color is still the cornerstone of our company. The process has changed, but the standards have stayed the same. Since late 2005, our primary focus has been on giclee printing. We have provided the finest color separations for fine art reproductions since the company was founded. 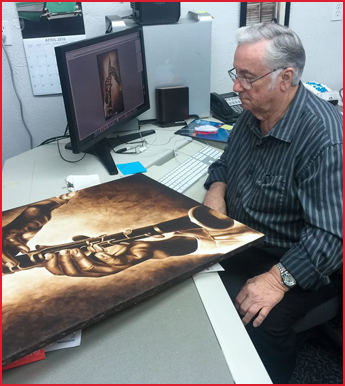 In 1997, at the request of some of our fine art clients, we began digitally printing paintings directly to canvas. These "giclee" prints use archival materials and inks that some third-party researchers estimate a life span of over 150 years. In late 2007, we introduced American Giclee Gallery. This allowed us to promote and distribute our clients and friends' art. Our fine arts group produces giclee prints and digital scans directly from original artwork. Artwork or any rigid original up to 60" x 90" are digitally scanned by the CRUSE Scanner. In some instances where the original is not available, color transparencies are scanned on high-end, PMT drum scanners. The resulting digital image is then output as a giclee print directly to canvas or fine art paper with archival, color-fast inks. Our large-format digital print group produces many types of indoor signs, banners, posters, display graphics, and point-of-purchase materials. American Litho Color offers UV-pigmented prints on dozens of different materials up to 60" x 100'. Finishing services include, but are not limited to, mounting, laminating, coating, die-cutting, and grommeting. In 1971, American Litho Color began building a reputation for producing consistent, high-quality film separations. That same standard for quality lives on today; only the process has changed. Whether it is prepress production, ad production, signage, or fine art giclees, American Litho Color has the capabilities to turn your project into a work of art. Our President, Arthur Rawlings, is fond of saying, "To say we reproduce fine art is like saying Michelangelo painted ceilings."